AMD Gonzalo APU spotted – Zen 2 plus Navi 10 Lite? Just ahead of the weekend, prolific computer components leaker TUM_APISAK shared an intriguing graphic. The image is a breakdown analysis of a computer processor codename that had captured TUM's gaze, an AMD APU designated 2G16002CE8JA2_32/10/10_13E9. Thankfully, there was a catchier name for the component: AMD Gonzalo. Above you can see the image shared by TUM and the decoded AMD codename. This image can be clicked on for a clearer, larger image. Using known AMD naming conventions it can be determined that 2G16002CE8JA2_32/10/10_13E9 is a second generation octa-core Zen processor. However, it isn't certain this is a Zen+ or Zen 2 architecture. The second character, G, suggests this is a gaming part, and elsewhere within the digits it is indicated that the CPU has a base/boost of 1.6/3.2GHz. For reference, the PS4 Pro tops out at 2.13GHz, and the processor in the Xbox One X at 2.3GHz. 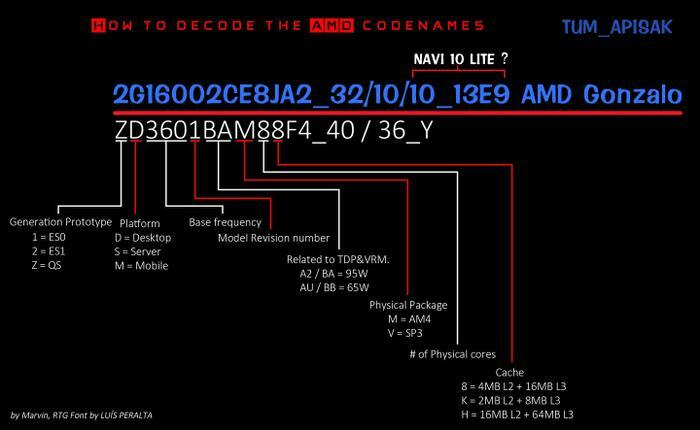 Further along the character string is the designation 10_13E9 which TUM says represents the inclusion of Navi 10 Lite graphics cores. We are on less certain ground here but the GPU could come with a base clock of 1GHz. Adding in a sprinkling of other rumours (and more salt) – for example that AMD Navi will launch at E3 in June, it is possible that we might hear about AMD Gonzalo at that time and we might get the first teases regarding the upcoming PlayStation 5 and Xbox Scarlett. Well You can't put a CPU in console that has boost clocks.. That would play havoc with people having differing experiences in game performance,depending on temperatures and the silicon lottery. I'm sure your're right, though a BIOS tweak could knock out any boosting to fix that. Still, that base clock smells of laptop part to me. Don't think it will be an issue - VRR will be standard on next gen so the console will just adjust frame rate to meet the performance. They'll be developing software that in the future will run on the Xbox 2X / PS5pro so will anticipare varying screen resolution/performance. The CPU will also adjust CPU vs GPU balancing for the TDP according to a known strategy so the dev can balance non-time critical CPU tasks away from peak GPU load. Yeah, base/boost that far apart reads like a laptop part choked down to a lowish TDP to me as well. The console version will presumably be related to this but semi-custom to whatever design they want, same as the Jaguar APUs all were. AMD uses its die designs for multiple purposes. With the low base clock this is dialed in as a laptop CPU. But with a higher fixed clock (or a well tuned boost strategy that only down-clocks the CPU while you're not playing a game, keeping down power consumption while you are navigating the menus or watching a movie) it could also serve as a console part. So far as I know, AMD has only released three Ryzen die designs to date: the first generation, the second generation, and the APU. Every Ryzen, Threadripper, and EPYC variant is binned from one of those designs - in multiples for Threadripper and EPYC. Similarly, I expect all the third generation parts to use a small number of chiplet die designs that are combined in various ways.